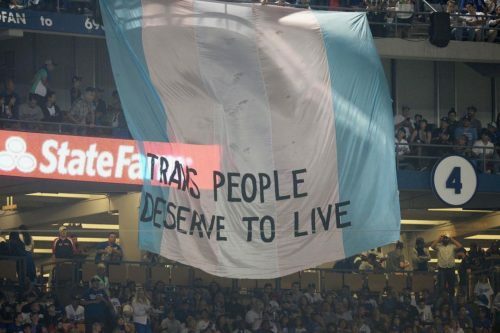 Activists from the [email protected] Coalition unfurled a mammoth banner from the upper deck of Dodger Stadium that read “Trans people deserve to live” on a background of the trans flag. Maria Roman and Bamby Salcedo dropped the huge banner they smuggled into the stadium as a protest of the Trump administration’s nonstop attacks on the civil rights of transgender people. SB Nation reports that the banner stayed up for several minutes before being removed. Trans People Deserve To Live!